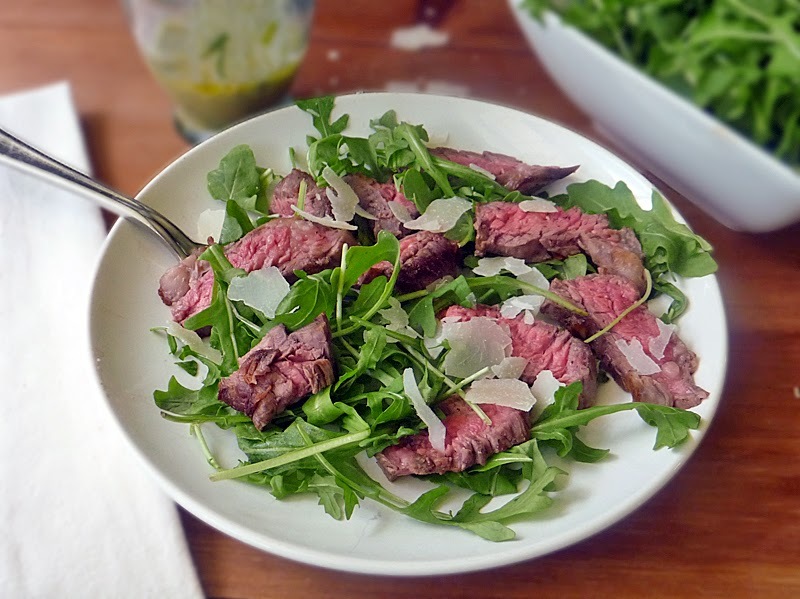 I made this delicious Grilled Steak with Arugula Salad, photographed it, edited the photos, and I still had time to sit down and enjoy a leisurely lunch all while vacuuming my floors at the same time!! No, I don't have a twin, a clone, or 10 arms either! Wanna know my secret?? Just when I thought my iRobot couldn't get any better, it did!! My Roomba didn't get a software upgrade, and I still haven't figured out how to get him to do the laundry, but he is working longer for me on each charge thanks to my Lithium Power Inc. Replacement Battery! As a result, my house is cleaner, and I have more time to spend enjoying lunch!! Forgive me while I interrupt this recipe and take a moment to share one of my new favorite things! You'll find the recipe a little further down the page today, I'm straying from my norm a bit, because I was so excited to share this with you! Lithium Power Inc saw my review on the iRobot Roomba 585 Model and contacted me to inquire if I wanted to test the first and only lithium replacement battery that is fully compatible with iRobot Roomba series 500, 600, 700 and 800. You bet I do! I was excited to see what this battery could do, as it came with promises of lasting twice as long on a charge as the typical Roomba battery! I was skeptical to say the least, but willing to give it a chance! Don changed out the battery in mere minutes, with ease, and I got it on the charger! While Roombie was doing his thing, I was able to get some work done. An hour went by and he was still plugging along. I decided to go ahead and prepare my latest recipe for the blog. I even had time to photograph it, and he was still going!! I edited the photos and he was still going... I got to sit down and enjoy my lunch while watching my little robot just keep on working!! My little Roomba ran for over 4 hours!! 4 hours y'all!! That's more than twice as long as the original Roomba battery! I was so proud!! He was like the Energizer Bunny!! He just kept going and going and going.... and all the floors were clean even before he was out of power! This was big!! HUGE!! Like, time to throw a parade kinda big! That's no joke! If you are in the market for a new Roomba battery, you'll definitely want to check out Lithium Power's battery! Way more bang for your buck!! Visit their website to get complete product information and to purchase directly from them with free 2-3 day domestic shipping! Disclosure: Although, I received the product at no charge, I have been using the Lithium Power Inc battery for a little over a month now and all of the opinions expressed in this review are my own as a result of my actual experiences with the product. If my opinion changes over time, I will update this review. Back to our regularly scheduled recipe! 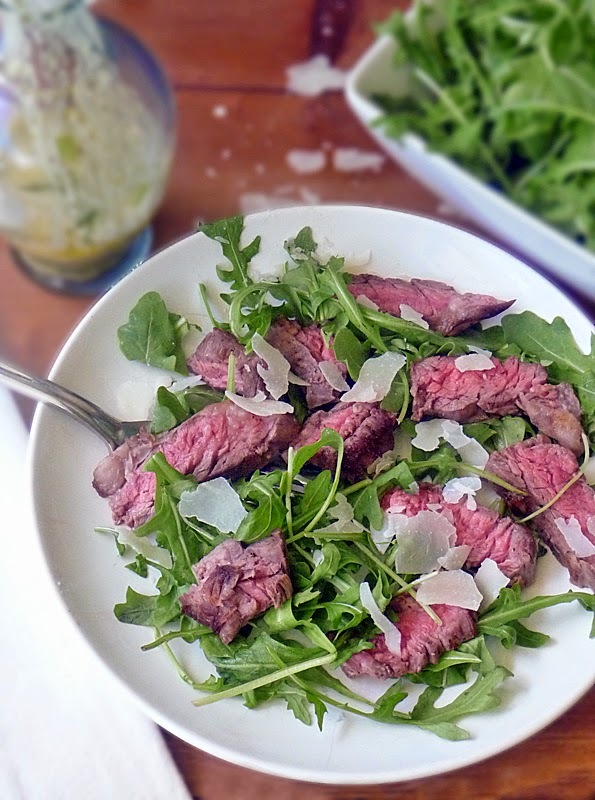 This Grilled Steak with Arugula Salad is a healthy and delicious, low carb meal! I love the tangy dressing and topping it off with Parmesan is tres good!! Enjoy! Remove the skirt steak from the fridge and allow it to come to room temperature. Salt and pepper the steak on both sides, generously. Combine 2 tablespoons softened butter with 1 teaspoon freshly minced garlic and a pinch of salt. Rub the garlic butter all over both sides of the steak. Preheat an outdoor grill or a grill pan to 375 degrees F. Grill steak for 3 minutes on both sides until it is mid-rare. Adjust the cooking times as needed depending on the thickness of your steak. Remove the steak from the grill pan to a cutting board and allow to rest for 10 minutes. Tip: I place my cutting board onto a foil lined cookie sheet to catch and drippings and make for easier clean-up. Combine 2 tablespoons chopped fresh chives, 2 tablespoons lemon juice, 1 teaspoon Dijon mustard, and a pinch of salt and pepper. Mix well. Give it a taste and adjust seasonings to your liking. Place the arugula into a serving bowl and drizzle with the dressing. Toss to coat. 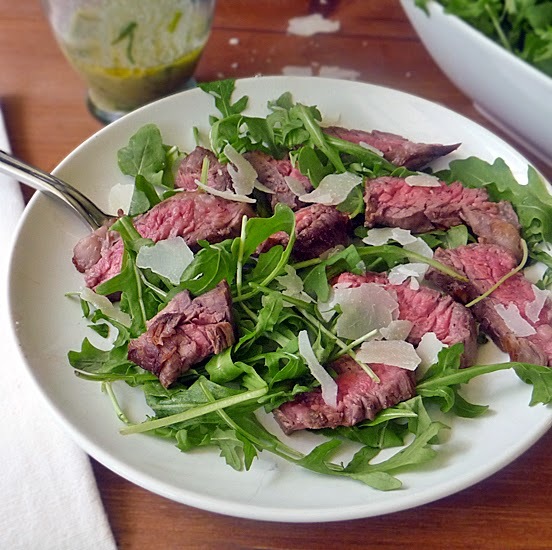 Slice steak thinly against the grain and toss in with the arugula. Top with Parmesan Cheese as you like and enjoy! If the Roomba picks up dog hair, I'll take it right now. Our dog has shed so much we could knit together several other dogs just from the fur she has shed! I have a dyson, and while I love it (almost) better than my husband, I'd love to have a roomba!! Good to know about the new battery, should I ever want to replace my (husband) dyson and try out a roomba! haha 'That salad looks so good. Two of my favs! We always have a bit of leftover flank steak when we grill it on the weekend...what a terrific way to repurpose it! SO yummy! Don't you just love flank steak?! Oh my goodness it is so good no matter how you eat it!! Thanks for stopping by, Liz! This looks sooo good and easy! My two favorite things! I love steak salads so I'll definitely be giving this one a try! Great recipe! It's a must make, for sure. My aunt has a Roomba, and she loves it! Always nice to have a fast and tasty salad recipe. I love arugula, which gives you a somewhat bitter but fresh bite. Both it and spinach are healthy and delicious. I always love adding meat to my salads! It adds so much favor, especially steak! Looks amazing! Thanks, Sandra! Too funny about the cats! When our dog was younger he would bark and bark at the Roomba after we first got it, but as he aged he just gave it nasty looks when it came near him haha. Gotta love our furry friends! When you figure out how to get the roomba to do laundry, let me know - I could put mine to work too! Wow this looks like the perfect meal for the summer time! This looks great. The perfect summer dinner. That sounds absolutely delicious. I would love to try this and SOON! How yummylicious! I need to try this out! Thank you for sharing! Oh my goodness, that looks amazing! I would totally devour that! Aw man, I have wanted a Roomba for ages. Didn't know that you could get a powerful battery like that. Really good to know when I'm ready to get one. Thanks! Definitely a good thing to put on your wish list, Kassondra! And the battery is a must have, in my opinion. It is really nice not having to clean the floors 'in shifts' because of multiple chargings! I have always wanted a Roomba! This is awesome! I definitely recommend it!! Thanks for stopping by, Debra! Your Roomba sounds like a super time saver! Thanks for sharing your recipe too. I LOVE skirt steak! YUM! Thanks, Krystal! It really is a great little machine!! I can see that this would be a salad my boyfriend would go ga-ga over. I'll have to make that, and yay for the Roomba!